ThermaCool® TC2006 and ThermaCool® TC3008 thermally conductive gap filler materials are inherently tacky. 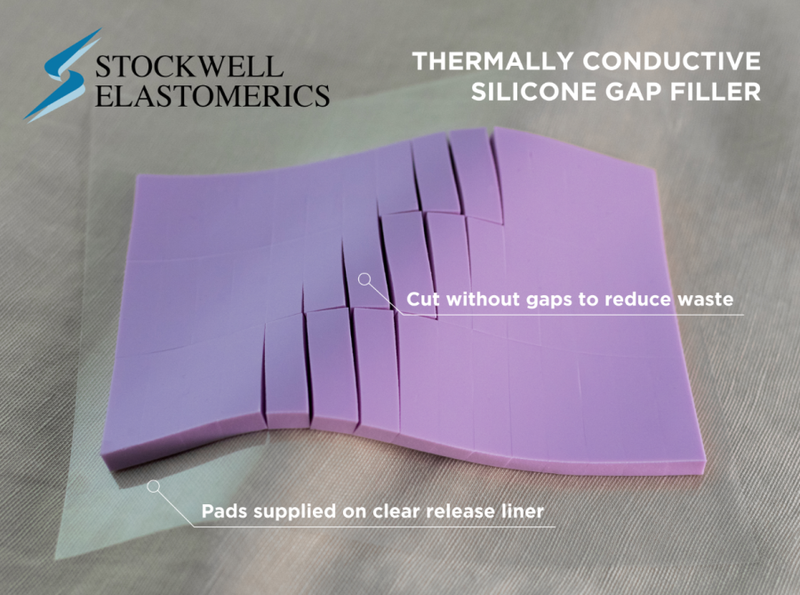 When thermal gap filler pads are cut from these silicone gel base materials using water jet cutting and die cutting processes, our experience indicates they need to stacked and separated to prevent the tacky edges from sticking together. However, this secondary procedure adds cost and additional handling. Stockwell Elastomerics invested in a digital flash cutter to complement its water jet cutting and die cutting capabilities. The high speed knife blade can be programmed to kiss cut thermal gap filler pads from .020” to .250” thick against a protective release liner. However, the high speed digital knife cutting process reduces edge tackiness, allowing thermal pads to be provided on a sheet with a material saving common line cutting patch. TC2006 and TC3008 thermal gap filler pads can be provided with minimal edge waste, without the secondary stacking and edge separation process. 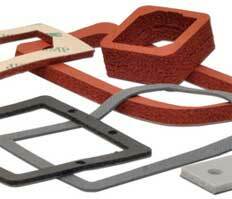 Thermal gap filler pads are available in .020” thick to .250” thick. These pads are provided with a protective release liner on both sides that is removed during assembly. TC2006 Thermal Gap Filler (datasheet PDF) has a good balance between thermal conductivity (1.6 W/m-K) and less compressive force. TC3008 Thermal Gap Filler (datasheet PDF) provides higher thermal conductivity (3.0 W/m-K) with slightly firmer compressive force. Note: Ultra-soft ThermaCool® TC3006 (1.1 W/m-K) and Bergquist Gap Pad® V0 Ultra-Soft can be cut readily using the digital flash cutter. However, the digital cutting process does not eliminate the edge tack of these ultra-soft thermal materials. 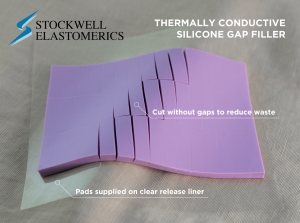 Contact Stockwell Elastomerics for further assistance with thermal gap filler pads and thermal interface materials. ThermaCool® is a registered trademark of Saint-Gobain. Gap Pad® is a registered trademark of The Bergquist Company.